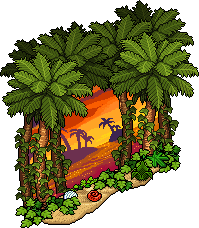 Summer 2011 brought a whole new idea to Summer on Habbo, not only did players receive a new range, but they also received Shell Gifts to spend and collect. These accumulated towards items such as Rare Sea Thrones and Ice Cream Trollies. However, in the new range that wasn't part of the Shell Gifts, only three items made it onto Habbo! This range has been popular throughout all seasons and the items within it are worth more than previous ranges released! Ghettoblaster Blast your fave summer tunes! Beach Bonfire PWill set hearts ablaze! Sunset Wall Like long walks on the beach? This page was last edited on 20 July 2018, at 22:45.